We currently have a long medical form online. The Office manager tells me that the form is not printing out correctly from their secure submissions login page. They tell me that the pages seem jumbled, break up and chop off data. I would like to force data to print more organized, per page. so I'm thinking that maybe I need to add "Page Breaks"? Although not sure how the entire form can be printed out by the user if desired, since the print button will only print the page it's currently vewiing, not the entire form... I think. Please help, Thank you. As I have tested a form with multiple pagebreak, unfortunately, that will not print per page even you put seperate print button on each break. 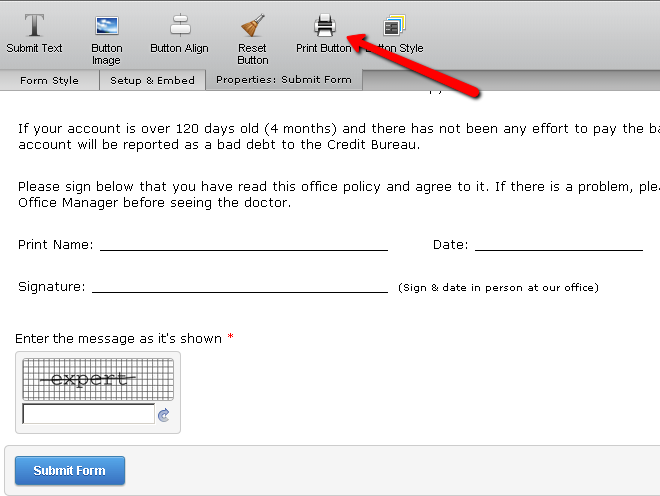 Also, you should add a print button beside submit button, in this way, he would not have any problem prinitng the form. Kindly let us know if you need further assistance so that we could help you.